After many years as Greely’s School Resource Officer, John Dalbec will be rotating back to patrol this summer with the end of the 17/18 school year. John’s many accomplishments, relationships and the massive investment of time and effort will long be remembered in our schools’ parking lots, hallways, and classrooms. Over the past two weeks, we held an inclusive process aimed at selecting our new SRO. This process included input from Cumberland PD, an outside SRO, school staff and students. Applicants were required to complete multiple essay questions, successfully deliver a classroom presentation, and sit for a comprehensive interview panel. 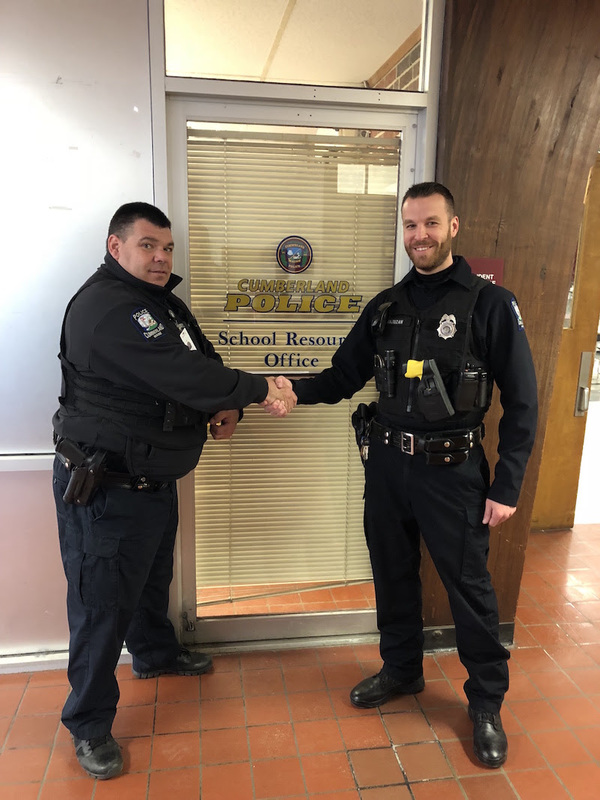 As the result of that process and after consultation with Superintendent Porter, I am pleased to announce that beginning in the fall of 2018, Officer Kirk Mazuzan will begin his duties as Greely’s new School Resource Officer! Officer Mazuzan is well prepared to succeed in his new position. He is a Cumberland native who attended school here from K-12. After graduation from GHS, Kirk went to college at Plymouth State and USM, graduating with a degree in Media Studies with an emphasis on writing. Throughout high school and college, he worked for the town’s Summer Recreation program, beginning as a counselor and eventually becoming the director of the town’s Day Camp. After college, Kirk worked at North Yarmouth Memorial School teaching technology to 4th and 5th grade students. He was hired by the Scarborough Police Department and attended the Maine Criminal Justice Academy in 2006. In 2008, Kirk returned to teaching at NYMS as the Technology Integration Instructor, where he remained until 2010. When that full-time position was eliminated, Officer Mazuzan returned to law enforcement with the Cumberland Police department, where he’s been ever since. At the Cumberland Police Department, Officer Mazuzan has served as a Field Training Officer helping to teach, coach and mentor newofficers as they acclimate and settle into their role as our community’s guardians. Kirk is one of the “voices” of the Cumberland Police Department’s Facebook page, as we work to keep residents and visitors to our town informed and sometimes entertained. He manages a grant program for the department, assists with crime scene investigation and evidence management, and has attended a multitude of specialized training over the years to include Basic School Resource Officer certification, child abuse investigation, criminal investigation, mental health / deescalation training, crime scene investigation and much more. In several weeks, Officer Mazuzan will attend a training out of state called the Physical Security Assessment Course which will allow him to assist the police department and school district with current and ongoing safety planning. As you can see, Kirk’s unique blend of education and law enforcement will provide an excellent foundation for his work as Greely’s next School Resource Officer. Throughout the spring, Officer Dalbec and Officer Mazuzan will work together to ensure a smooth transition. Please offer your congratulations to Officer Dalbec on a job well done, and offer your best wishes to Officer Mazuzan for great success in the next phase of his career!